Step 1 Heat the oven to 450 degrees. Using a mortar and pestle, crush the garlic and fennel seeds and mix them together. Add the salt, pepper and chiles and combine. Step 2 Cut 1-inch wide slits all over the surface including top and bottom of meat. Rub the garlic-seed mixture into the slits. Step 3Heat 2 tablespoons olive oil in a large, heavy Dutch oven. Sear the meat on all sides over medium-low heat for about 10 to 12 minutes. Do not allow the garlic to burn. Step 4Remove the roast from the pot, add the hot water, stirring and scraping the bottom to deglaze the pan. Place a rack in the bottom of the pan, add the meat, fatty side up, and roast in the oven uncovered for 30 minutes. Step 5Pour the lemon juice and the chicken broth over the meat. Brush with the remaining olive oil. Step 6Reduce the heat to 250 degrees, cover the pan and roast the meat 8 to 10 hours, occasionally basting with pan juices. The roast will be done when the meat is falls apart when barely touched with a fork. Step 7Remove the roast from the pot and place it on a serving platter. Skim the fat from the pan drippings. Serve pan drippings on the side or drizzled over the meat. In Recipes-list.com we have selected the most viewed recipes from category - Best recipes Main courses . Enjoy the best recipes specially selected for you! 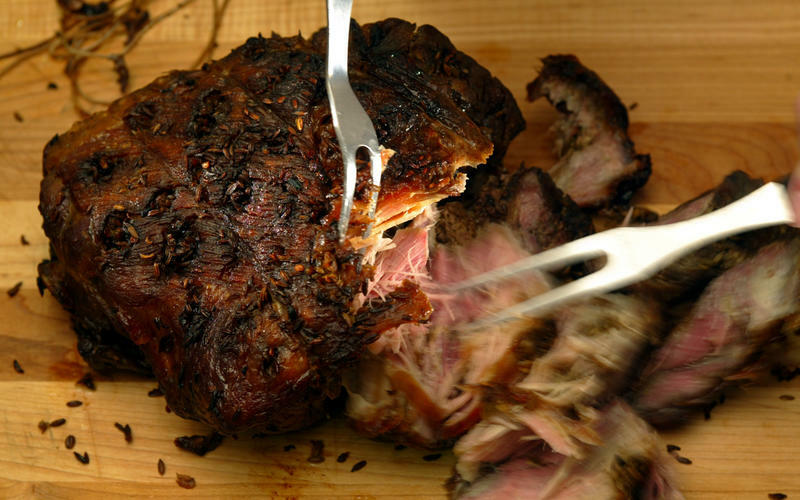 Slow-roasted shoulder of pork is the right choice that will satisfy all your claims.